What Ages Do Turtles Live To? Turtles and tortoises are often confused, but there's a big difference between them. Turtles live in water, including the oceans, rivers and even lakes. Tortoises are land animals. Both turtles and tortoises are reptiles and share many common characteristics, including long lifespans. Turtles live shorter lives than tortoises, mainly because of the added risks found in the water. According to the San Diego Zoo, tortoises can easily reach 150 years of age, while turtles live about 70 years. It's harder to track the lifespan of sea animals because of their nomadic habits, so the numbers are approximate. According to National Geographic, leatherback turtles can claim an impressive record: they're the longest-living creatures still in existence to roam the oceans. That's right -- leatherback turtles date back to before the time of the dinosaurs, more than 150 million years ago. Leatherback turtles are also one of the most endangered species of turtles in the world, National Geographic reports. Fishing nets and hooks are accidentally killing thousands of turtles every year. Turtles are susceptible to the quality of the beaches -- where they lay their eggs -- and oceans. For example, trash thrown in the ocean can kill both adult and baby turtles. Because turtles lay eggs in the sand, poorly maintained beaches can also be an issue. On the other end, beaches that are overly groomed or developed can also be a problem. 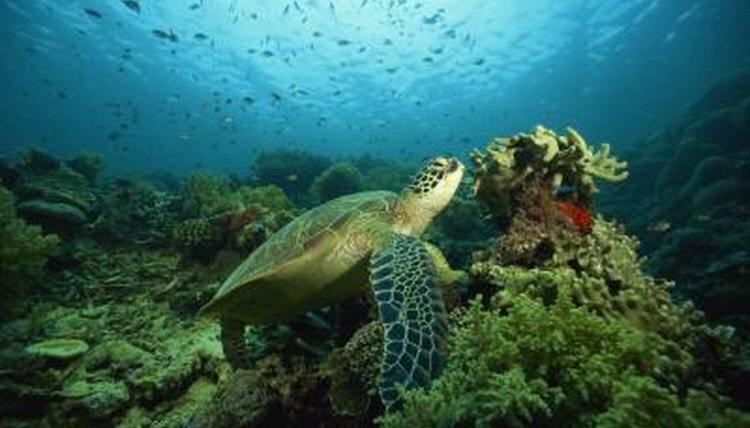 Roads, hotels and tourism have affected the environment of turtles considerably, leading to enhanced danger and early deaths. For example, bright lights -- from driving on the beach or from hotels and restaurants near the sand -- can cause disorientation and affect the life cycle of the turtle. Instead of heading for the ocean lit by the sun or moon, some hatchling turtles go towards the lights of the buildings. Many turtles don't make it to their first year of life. That's because younger turtles are slower and more susceptible to predators. According to the Florida Fish and Wildlife Conservation Commission, 999 of every 1,000 turtles will die before reaching 1 year of age. That's one of the reasons why females lay a high number of eggs -- somewhere between 80 and 120 -- at once, in hopes that at least some of them will survive. What Do Turtles Do When They Hatch? Do Turtles Come in Different Sizes & Colors? What Kinds of Turtles Live in Canada? How Long Does It Take a Box Turtle to Become an Adult? What Kinds of Turtles Live in Florida? Why Do Turtles & Tortoises Live So Long?